Discussion in 'iPhone and iPad Games' started by killercow, Sep 8, 2016. Since 2009, the STEINS; GATE series has sold over 1,000,000 copies! 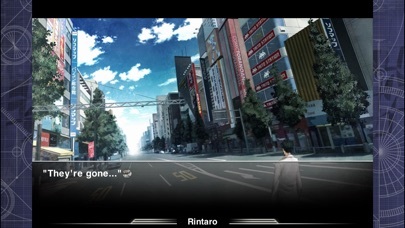 "STEINS;GATE", based on the anime currently being broadcast has finally been released for iPhone and iPod touch! * The game supports English only. - Tag Line The 12th theory that could even blaspheme God -- That is a product of chance we obtained. - Product Summary STEINS;GATE is the second collaborative work between 5pb and Nitroplus with a science-fiction/adventure theme. Released on October 2009 for the Xbox 360, it won the highest Famitsu Award (Japanese video game magazine). Later, the game was released for the PC & PSP, along with additional merchandise such as spin-off video games, character songs and drama CDs. The series has sold more than 100,000 copies. An anime adaptation began airing on April 2011, and it is becoming increasingly popular. 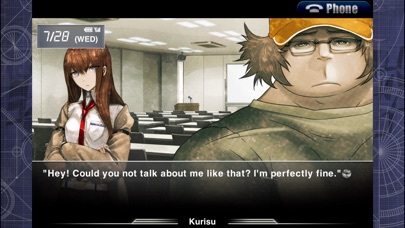 The story found in STEINS;GATE is not your usual time traveling fare, but is a "hypothetical science adventure" focused on the structure of time travel itself. Many of the situations and scientific concepts referred to in the game have been plucked from real science; the story-line is therefore credible and intellectual stimulating for players. - Features * A suspenseful adventure game based on time travel! * The story takes place in Akihabara and revolves around science-fiction, touching on subjects such as SERN, John Titor, "IBN5100" PC and more! 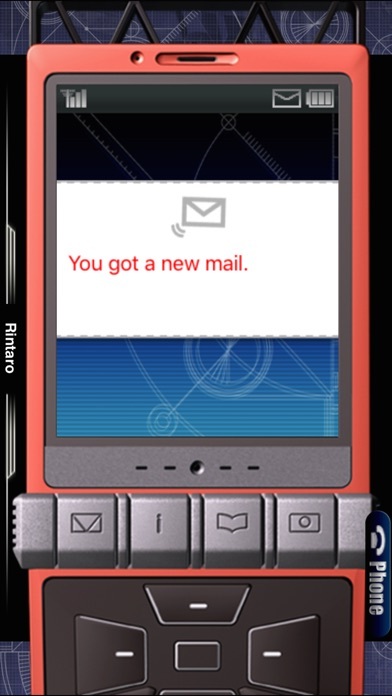 * The game features the phone trigger system, optimized for iOS. The plot will progress in a specific direction depending upon the player's choices and responses! * Play as one of 6 characters with various endings for each! (Including one male character) * Full voice acting! * More than 30 hours of total game-play! * Featuring an original plot by Chiyomaru Shikura, character design by huke, gadget design by SH@RP and scenario development by Naokata Hayashi (5pb.)! * OP movie and end sequence based on the Xbox 360 version. - How to play Intuitive touch panel controls ensure a smooth game-play experience! • Common controls Phone Panel: Invoke phone trigger/Close Two-finger tap (Or pinch-in): Show Tap: Forward text, Confirm Swipe Down: Show log screen Swipe Up: Hide message area Swipe Right: Skip read messages Swipe Left: Force message skip One-finger tap and hold: Auto mode • Original controls Hold portrait orientation: Invoke phone trigger Hold landscape orientation: Close phone trigger - Story Rintato Okabe known as "Okarin" is a university student with second-grade syndrome. He is a self-proclaimed mad scientist named as "Kyoma Hououin". He is the founder of what he calls the "Future Gadget Laboratory" where he spends most of his time inventing odd things along with two other members. One day, they accidentally invented a "time machine" that could send text messages to the past... SERN, John Titor, an old computer "IBN5100", the time machine and butterfly effect, the 11 theories for time traveling.- When a number of factors coincide, a global-scale event will break out from Akihabara! Entrusted with the fate of the future, which decision will Okarin make? Just a huge fan of the anime series but I am glad to finally get the chance. Was looking forward to it. Hitting the purchase as soon as I get home. But it's the full game you can play with 6 diff characters giving you several diff outcomes and a lot of gameplay hours. I just bought this. Have been waiting on it for a while. I'm a new "fan" of Steins;Gate in that I have watched the pilot of the anime and loved everything about it. But now I plan on going through this game, before moving on with the anime. Is that sound? You guys won't believe that I've been checking for this game for the past 3 days in the appstore every day, every few hours for this to show up. I was so hyped when I knew it was coming out on the 9th that I kept checking to see if it would "release early". Turns out it comes out after I go to bed... funny. So anyhow, dropping the $25 now. I hope I have enough room on my device. Going to need that new bigger iP7 soon! Also interesting that the other language versions just dropped in price last night and this one is normal priced. Not sure how that works.. I'm surprised Korea got all the other side stories translated to their language and are already released! Wait, I just realized this is an iPhone app when I started it up. It all looks a bit pixelated blown up on an iPad Pro. Why is there no iPad version? They probably won't update it to be Universal either. I read they're supposed to be releasing an HD ipad version. Not sure if it's out yet or not. But it was on some of the news sites. I think the original Japanese version also has an HD version. The press release said that a separate HD version was supposed to come out today. So far, nothing. Almost hit buy button until i saw iphone only! I hope there will be ipad version soon! Hate to nit-pick, but I really hope the English subs are better than the reams of garbled text in the app description! Fully on board with Japanese voices and English subs, though, as a general rule. 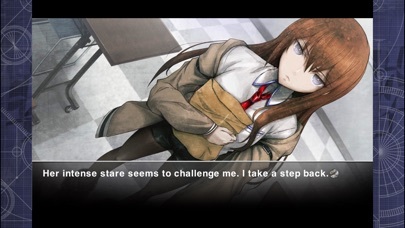 Is this the same steins gate like on pc? Holding then and waiting for HD version. Damn, I should have waited for the HD version. So stupid. Anyway, can someone explain how exactly to get up the menu, and backlog? I press with two fingers on screen and sometimes it works, and sometimes it doesn't. Off memory I believe swiping one finger up pulls up backlog. Is it not possible to get refunds through the App Store or some other way? I asked for a refund and will get it granted in 5-7 business days. I'm glad about that. Here's waiting for the HD version!